Its much-excavated tel, a mound rising 60 metres above its surroundings, has revealed the remains of at least 20 cities built one on top of the other. The 6-hectare site has yielded temples, lavish palaces, massive fortifications, private houses, a grain silo and an elaborately-engineered water system. 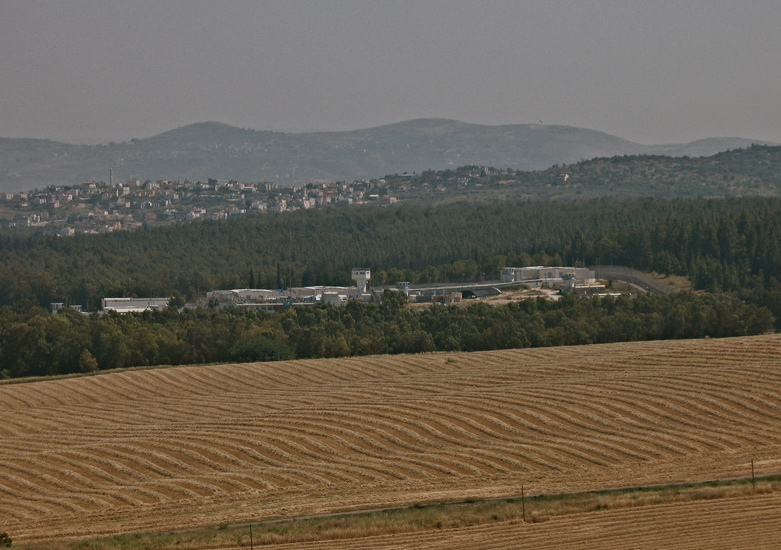 Megiddo is 35 kilometres southeast of Haifa, at the southern end of the fertile Jezreel Valley. Destroyed and rebuilt many times during its turbulent history, it was occupied almost continuously from around 6000 BC until about 500 years before Jesus Christ was born. From its strategic position, overlooking the key pass through the Carmel Mountains, it dominated the crossroads of ancient trade and military routes that linked Egypt with Mesopotamia and Asia Minor. Armies of all the great generals who campaigned in the Middle East tramped across the plain of Jezreel, from the Egyptian pharaoh Thutmose III to General Edmund Allenby, including Alexander the Great and Napoleon. As Thutmose III claimed in the 15th century BC, “Capturing Megiddo is as good as capturing 1000 cities”. In 2005 the remains of an ancient Christian prayer hall were uncovered in the grounds of a nearby prison. 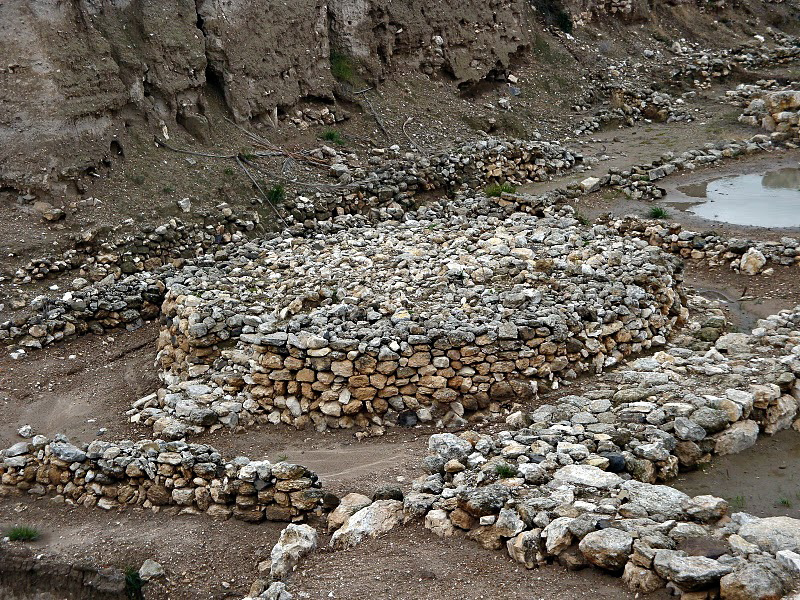 Dated to the middle of the 3rd century, this may be the oldest church discovered in Israel. A mosaic inscription with the words “God Jesus Christ” may be the earliest ever found that mentions Jesus Christ. Megiddo has been the site of epic and decisive battles down the ages. The Battle of Megiddo in the 15th century BC, when Egyptians under Thutmose III conquered Canaan, is the first reliably recorded battle in history. 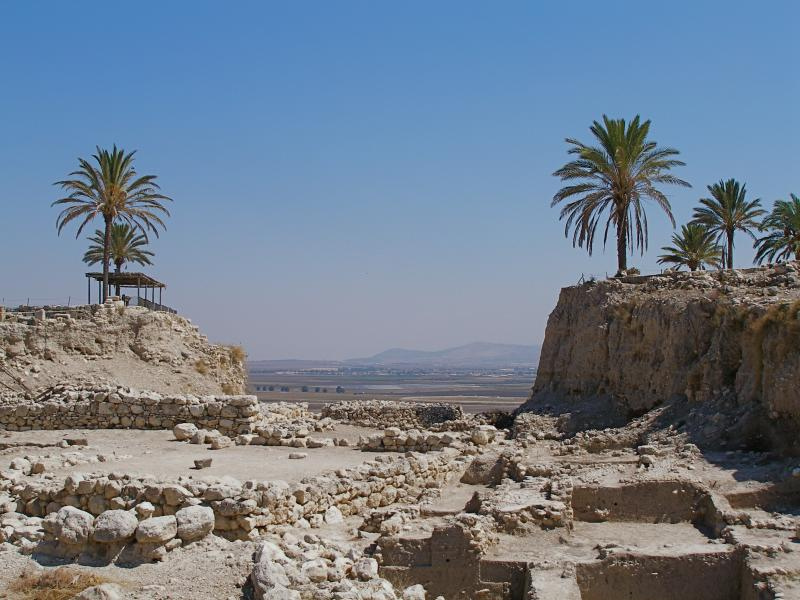 Battles around Megiddo are mentioned in the Old Testament. The “king of Megiddo” was among those Joshua defeated after the Israelites entered Canaan in the 14th century BC (Joshua 12:21). A century later the Israelite prophetess Deborah routed the Canaanites “by the waters of Megiddo” (Judges 5:19-21). Two kings of Judah, Ahaziah and Josiah, were battle casualties at Megiddo (2 Kings 9:27; 23:29-30). In later times Greeks, Romans, Byzantines, Muslims, Crusaders, Mamlukes, Mongols, Persians, French, Ottomans, British, Germans, Arabs and Israelis all fought in this blood-soaked sector of the Holy Land. The 1918 Battle of Megiddo, in which General Allenby led British, Indian, Australian and New Zealand troops against the Ottoman Turks, was decisive in the Allied conquest of Palestine. When Allenby was made a viscount, he took the title “Lord of Megiddo”. Because Revelation 16:16 identifies Armageddon (from the ancient Greek Harmagedon, or Mountain of Megiddo) as the scene of an apocalyptic battle between good and evil, the name has become a dramatic byword for the end of the world. But, contrary to the beliefs of fiction writers, Armageddon is not described as the final battle. The final encounter, at Jerusalem 1000 years later, is to be the battle against Gog and Magog. The ultimate triumph of good over evil, it will precede “the new Jerusalem, coming down out of heaven from God” (Revelation 20:7-10; 21:2). 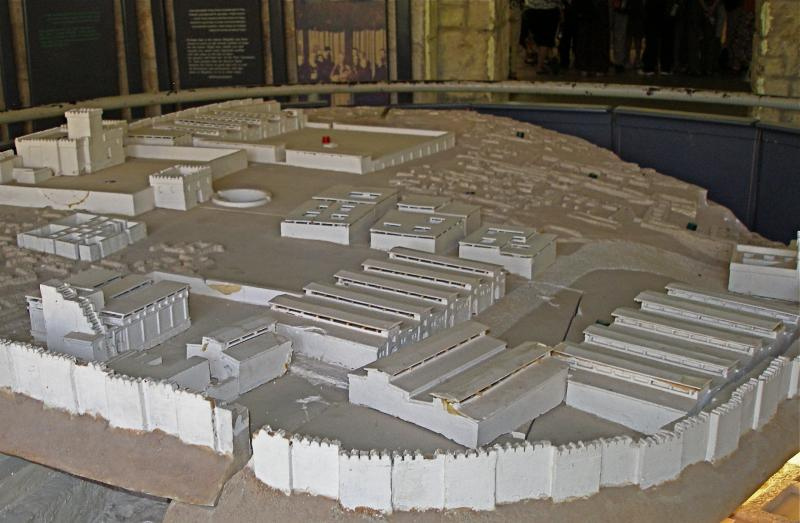 Visitors to the World Heritage Site of Megiddo have much to see, beginning with a model in the reception centre depicting the tel during the 10th-century BC reign of King Solomon — who used forced labour to fortify the city (1 Kings 9:15). • A flight of well-preserved stone steps from around the 7th century BC, leading from the city gates down to a plastered pool. • The Canaanite city gate from 1550-1200 BC. Flanked by four chambers, it led to the palace complex of Megiddo’s rulers. • A massive stone wall, 2 metres thick, marking the site of the Canaanite palace destroyed in the 12th century BC. A treasure trove of 382 carved ivory artifacts, including ornaments and combs, discovered in one of its rooms testifies to ancient Megiddo’s wealth and sophistication. 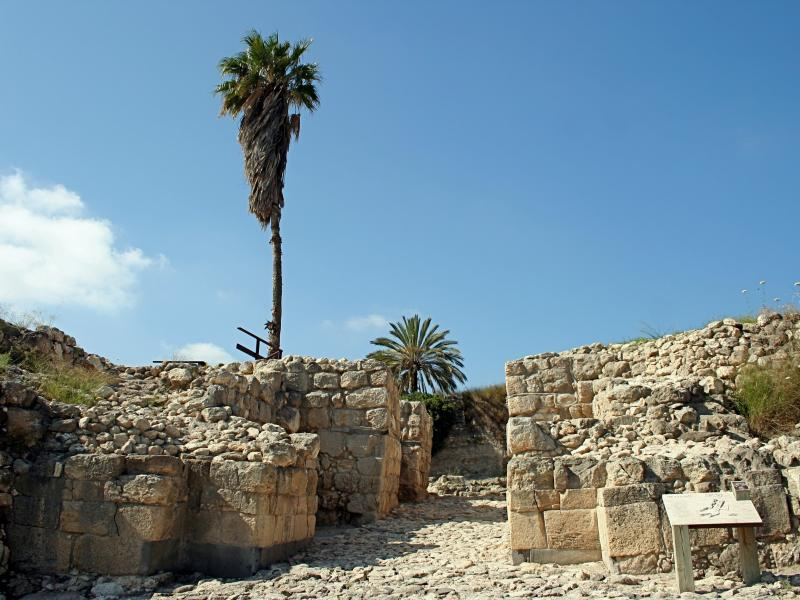 • Two elongated complexes often called Solomon’s stables, though now attributed to King Omri or King Ahab in the 9th century BC. Archaeologists also debate whether they were stables, some arguing they were too small for horses and were more likely storehouses, markets or even barracks for troops. 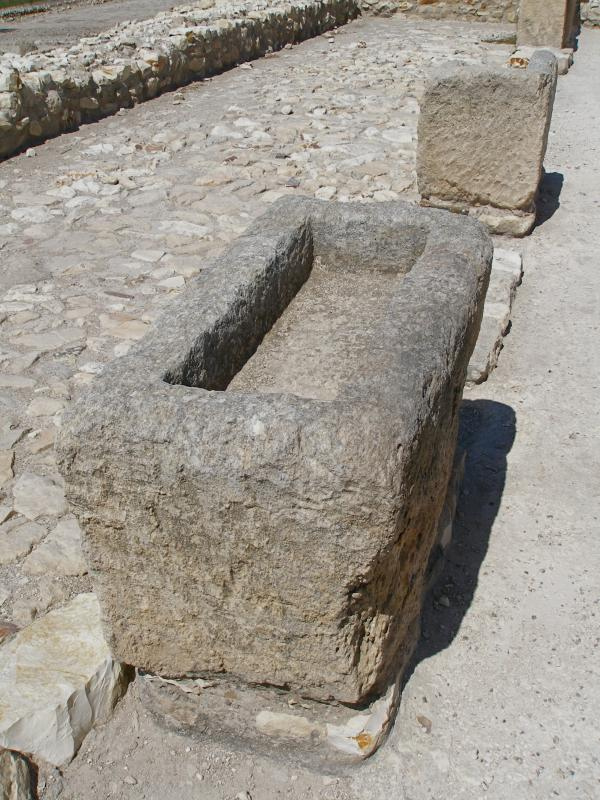 Stone troughs indicate that horses were fed in the area. • A “high place” with remains of several Canaanite temples and a circular altar of unhewn stones, 8 metres in diameter and 1.5 metres high, with seven steps leading to its top, where animal sacrifices took place. This sacred area, uncovered when archaeologists cut a deep channel through the tel prior to the First World War, was in use for 2000 years from about 3000 BC. • A huge circular silo, dug 7 metres into the ground and 11 metres in diameter, capable of storing 1000 tons of grain. Two staircases around the sides lead to the bottom and a domed roof probably covered the structure, which dates from 700 BC. 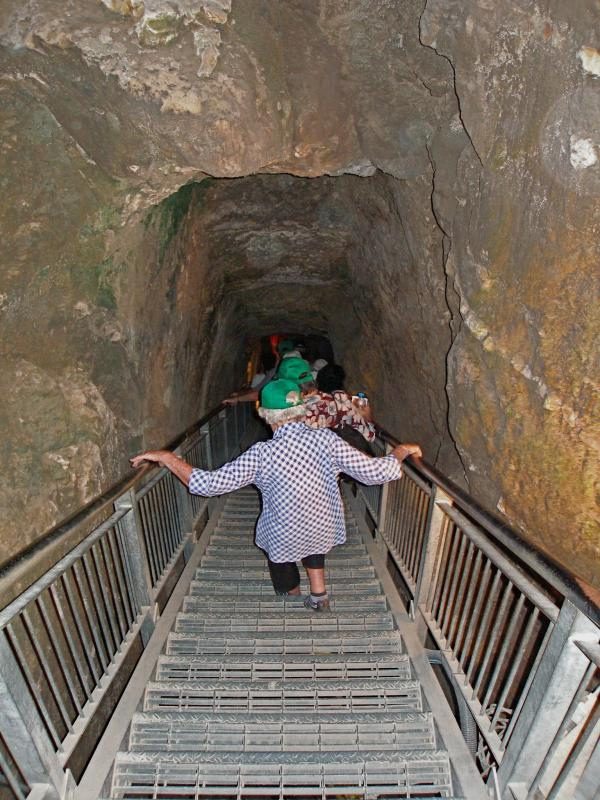 The most impressive construction at Megiddo is underground. To ensure access to the spring at the bottom of the tel’s southwestern slope, engineers in the much-besieged city dug a 25-metre vertical shaft down to bedrock, then a 70-metre tunnel sloping up to the spring. The tunnel was cut from both ends and the two gangs of workers had to make only a small correction before they met. Then the outside entrance to the spring was sealed with a massive stone wall and concealed with earth so a besieging enemy could not discover it. This monumental project was apparently undertaken during the reign of King Ahab, about 150 years before King Hezekiah quarried his water tunnel in Jerusalem. When it was completed, residents standing at the top of the shaft could lower buckets to draw water without entering the tunnel or leaving the city. Modern stairways — 187 steps down and 77 steps up — allow hardy visitors to view this engineering feat from the inside. 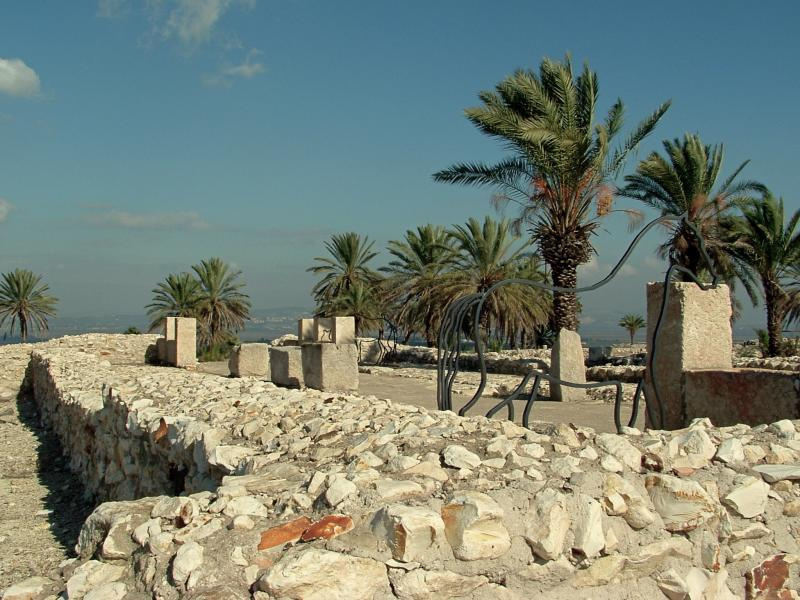 What may be the oldest church remains in Israel were also among the most inaccessible when they were discovered in 2005 — in the grounds of a military prison near Megiddo. Work on detention cells to replace a prisoners’ tent encampment was under way when an inmate worker discovered ancient remains. A prayer hall measuring about 10 metres by 5 metres was found in the southwest corner of a large building that also functioned as a Roman military administrative centre. Believed to be from the middle of the 3rd century — before Christianity became the religion of the Roman Empire — it evidently served Christian soldiers in the two Roman legions based there, as well as the local Christian community. In the superbly preserved mosaic floor, an inscription records that a woman named Akeptous offered the eucharistic table “to God Jesus Christ as a memorial”. No earlier inscription mentioning Jesus Christ has been found in the Holy Land. Other inscriptions name a Roman centurion, Gaianus, who paid for the mosaic floor; an artisan, Brutius, who made it; and four women — Primilla, Cyriaca, Dorothea and Chreste. Images of fish — an early Christian symbol — are also found. The Israel Antiquities Authority has recommended moving the prison to a new location so the discoveries can be displayed. In the meantime, the church has been covered with dirt and tarpaulins.